← 1 Peter Pt. 8 – Sermon Notes. We are not at war with the Government, even if it is at war with us. We are at war with sin. 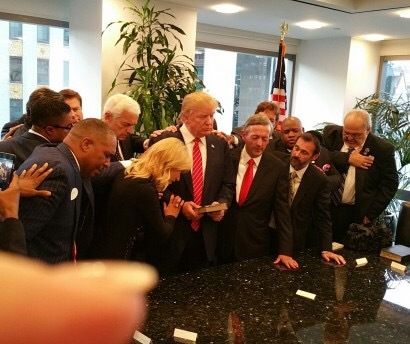 Monday afternoon Sept. 28,, 2015, as I understand it, Presidential hopeful/GOP frontrunner/multimillionaire/business mogul Donald Trump, met with some 40 religious leaders for prayer at Trump Tower in NY. Among those 40 or so gathered, were the likes of Kenneth Copeland, David Jeremiah, Paula White, Robert Jeffress and Jan Crouch. All there, ostensibly – at least in part, to pray for Donald Trump. The good: That prayer is offered up on behalf of one of those who would aspire to lead this nation. Christians would be praying for them. Praying for wisdom. Praying for the light of salvation to enter their souls and transform them into children of the living God by repenting and believing the Gospel of Jesus Christ. Praying that they would be ethical, upright, serious leaders committed to searching out the best ways and means to provide for the flourishing of the people of this nation. Praying that if they should in fact be elected to the highest office in this great country of ours, they would be world leaders impacting countless numbers through policies and actions that reflect hearts and minds determined to do what is best for people everywhere before the eyes of God. Praying that whether their favored candidate wins election or not, the one who does would be truly led by our glorious Christ in serving in that office with honesty, integrity, dignity, conviction, humility, clarity and excellence. To such prayers, I can only add my own amen. The Bad: No one there, could have been so naive as to attend such a gathering, without it being construed by those who look to them as spiritual leaders, as a tacit endorsement of Donald Trump’s candidacy. Knowing Trump’s past and public tactics, this HAD to become a photo-op of the highest order. And as “generic” as some of those prayers were, due to their publicized nature – they in fact are endorsements. And will be read by many if not most, as implying that Trump should be the “evangelical” candidate. Never mind his own personal ethics – which are questionable at best. His public adulterous affair with Marla Mapels, his 2nd wife. His being given over to amassing monetary wealth and ostentation. His building, owning and operating casinos – promoting some of the most grievous sins inflicted on the poorest and and most sin-addicted in our society. His public acknowledgement that he never apologizes for anything – hardly an even remote species of repentance. Foul mouthed, vilifying, denigrating of any and all who oppose or disagree with him, and a man possessed of a seemingly limitless ego. So men and women who supposedly profess their highest allegiance to the Cross and cause of Christ, will lend their names and ministries in the promotion of this man in such a public way? I am not shocked by much, but I am at this. Or rather – horrifibly sickened. Don’t get me wrong – these individuals are more than free to vote for whomever they please without fear of reprisal of censure from the likes of me. But to stand with him so publicly while in their roles of leading major Evangelical constituencies is tantamount to using Jesus to sell Trump. That my friends beyond egregious. The ugly: I can say without fear of any serious rebuttal, that Kenneth Copeland and Paula White are out and out heritics. Guilty of some of the worst crimes agains the Gospel and the Church of Christ as any in our age. And here stand, arm in arm – seemingly joined by politics with those whom they would utterly reject theologically – in a unified Religio-Political platform – men like David Jeremiah and Robert Jeffress. Is politics really the end game, so that the cause of Christ is to be used simply to further it? Shame. Shame on us. Shame on Evangelicalism in America that such a spectacle is even thinkable let alone actually possible. Hear me, please hear me clearly: Donald Trump cannot save America. Neither can any other candidate for that fact. Is he a Christian? I do not know. And in this respect it does not matter. I do know he has tapped into the anger of many – and that as Christians, such anger is not a right heart and mind from which we ought to be making our political (or any other) choices. For if it anger above everything else which unifies us, we are no different from the World. The only, the ONLY thing which can save America, is a wholesale rejection that politics can do anything of lasting and true value for this nation; And that the only thing which can is revival – a recalling of the Church to her first love and purpose in repentance, with a subsequent pouring out in prayer and preaching of the Gospel of Jesus Christ for lost men and women. And that, my friends, transcends this or any government. Jesus Christ in His saving power is our, or any other people’s only, ultimate hope. I still like Trump. He shows leadership abilities and at leat he doesn’t play nice face to face and then stab them in the back when they are not around. Let’s pray for all the left and right candidates.